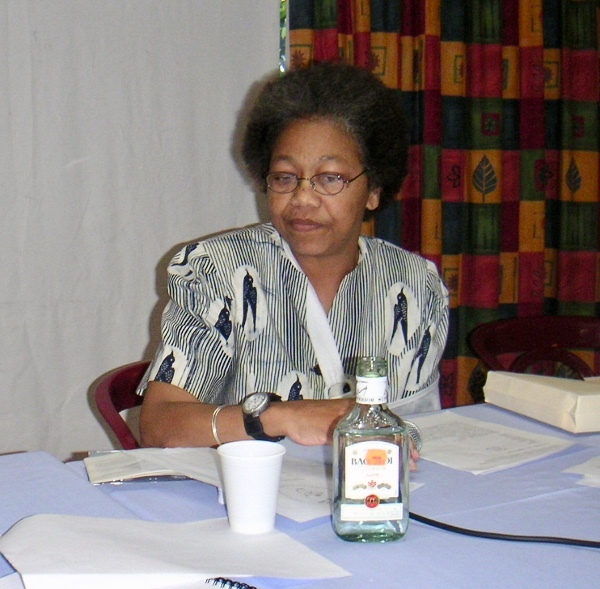 Lorna McDaniel lors de sa conférence à la 2ème édition du Séminaire d'ethnomusicologie caribéenne (juillet 2005). Before each performance of the Big Drum Dance, Carriacou family members who host the event wet the ground with Jack Iron - a strong , strong 150 percent rum. The wetting invites the Ancestors to the festival and feeds them as a way to honor and remember them. The pattern of the sprinkling imitates, cerebrally, the outline of the passage of spirit flight to the Big Drum ritual : North to South, East to West, creating a diagram of a cross. Years ago I took a trip to my birthplace Antigua, West Indies, where I had never visited. I left the Caribbean as a baby and knew nothing about Caribbean music, language or concepts. While there in Antigua I visited a very fine museum and met a man from Guadeloupe who knew a great deal about the Gwoka. Instead of enjoying the exhibits of the museum we talked and talked about our studies and compared the Gwoka to the Big Drum. I had just begun my research on Carriacou and could not say much. I never thought that some day I would actually be on your beautiful island representing the tiny, island of Carriacou. I wonder if the knowledgeable gentleman is here today. I didn't get his name, but I believe he was a worker with and scholar of the Gwoka. What is the Big Drum ? The Big Drum is a ringed dance event that incorporates song, drumming, dance, libation, food, drink. Also called the Nation Dance, this event is staged by any family wishing to provide a social and ritual "thank you" for good luck during the past year or present a ceremonial response to God's goodness. At the opening of a new house, the launching of a boat, a marriage in the family, a Big Drum may be offered. Though an English-speaking culture, 120 creole songs survive in the Big Drum. They continue in a call and response form with drum accompaniment. However, meanings have been lost to English speaking Carriacouans. Carriacou was once French-owned with many exchanges of power between England and France. The British finally fully possessed Carriacou in 1784. That so much French culture survives on Carriacou after only 117 years of French rule, occurring so long ago, is an extraordinary occurrence. There is a chorus of 6 to 12 women who sing and double as dancers. In the past there were also male singer - dancers, but now male dancers from the audience, having imbibed the strong Jack Iron rum, jump in the ring at the sound of the joyous music. Nation Songs (18th century), creole Songs (19th century) and frivolous Songs (20th century). Three male drummers seated on low stools play 2 side drums called Boulas, and one center, improvising drum, named Cutter. All drums are open bottomed drums, but the Boulas are played tilted from the ground which lowers their pitch. Unlike the Boulas the Cutter is played flat on the ground causing the pitch to be actual pitch and with its smaller size, higher in pitch. Across the head of the Cutter is a string with pins tied to it to create a snare that musically cuts through the ensemble. One shaker (a Chac-chac) is played by the leader of the singer/dancers to control and direct the music while an iron is used (any piece of iron or simply a spoon and bottle) to sound like a bell-gong. The drums that named the ritual Big Drum are no longer big, no longer sat upon, no longer dug out tree trunks. Its present height at 35.72 cm is a third the size of the Antillean drums reported by Pere Labat. 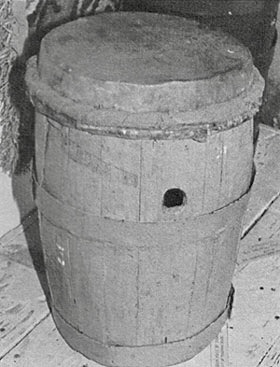 Carriacou drums were once made from slats taken from the huge rum keg that once held the strong rum, jack iron. The barrel's drain hole is kept in place to operate as the drum's sound hole. Goat skin heads were fastened with wiss vines and tightened with pounding and heat. I do not believe that these construction techniques survive today for younger drummers use screw-type manufactured drums. Nation Songs denote the nine groups among the enslaved people brought to Carriacou. These nine nations are known through rhythms kept by the Boula drums. It is a tonal drum practice and beats are fixed to songs stated by the chorus. In the past every song, Nation, Creole, or Frivolous had a specific, classifying beat. "Anancy-o" (1962) recorded by Alan Lomax in Carriacou (extract). We have gleaned from the drums the national roots of Carriacou's enslaved population. Ghanaian musicologist Kwabena Nketia states that "Songs serve as depositories of information on African societies and their way of life, as records of histories, beliefs, and values" (1974: 204). I will expand this quote to acknowledge drums too as history keepers. "Drums serve as depositories of information on Caribbean societies and their way of life, as records of histories, beliefs, and values." Fulbright to Germany 1960-62, to Trinidad 1987 ; U.of Maryland Ph.D. 1986 ; U.of Michigan Assoc. Prof. 1990-1996. Lorna McDaniel est fondatrice de la revue "New Directions: Readings in African Diaspora Music". Ethnomusicologue à la retraite, elle a enseigné à l’University of Michigan, a l'Universite du Nigeria et a la Cheyney University. Elle est l’auteur d'articles parus dans "The black perspective in music", dans "Black Music Research Journal" et a redigé les livrets accompagnant les 3 CDs de la collection Alan Lomax (Caribbean Voyage) sur le Big Drum de Carriacou. Son livre "Big Drum Ritual of Carriacou: praisesongs in rememory of flight" est paru aux Presses Universitaires de Floride en 1998. En 2004, pour le compte de Laméca, Lorna McDaniel a écrit le texte d'une exposition sur le Big Drum de Carriacou, qui est aussi en ligne sur le site Internet de La Médiathèque Caraïbe.